A teenage girl wakes up with no memory of who she is or where she comes from. The only clues to her identity are a dead mobile phone in her pocket and a beautiful amber necklace around her neck. 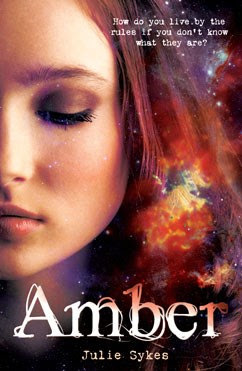 Suddenly, 'Amber' has a brand-new life, a brand-new name and a whole lot of questions. Disturbed by strange visions and powers, she struggles to understand the rules that everyone else seems to know. How can Amber make sense of the person she seems to be? Does she even want to be that person any more? And by falling in love with her new friend Dan, is she breaking the one rule that really matters? Amber has retrograde amnesia as a result of being a victim in a car crash. The driver of the car she was in died, but Amber doesn't know who the driver was, or where they were, or even who she is herself. That is, until she discovers who rescued her from the crash. From then on, everything changes. Amber reminded me a lot of myself! Seriously, she was described to look like me, we share the same name, we have the same necklace...I was convinced this was my life story in disguise until I found out that she is an alien. She was funny, smart and even with her special abilities she always seemed to have a lot of fun. Even in difficult situations, she dealt with them really well! I loved Dan. Chapters that included him tended to be more fun than the rest. I wish we could have witnessed more of Dan and Amber's relationship and I was heartbroken when they had to finish it. They never even officially went out. Somehow, sharing the same name as the main character made me empathise with her extremely easily as it was like it was happening to me. I was surprised that Dan took it so well when Amber told him who she really was. If something like that had happened to me, I would have freaked out and ran! This novel is quite sci-fi, but with a sprinkling of romance (just a sprinkle). There were a few minuscule things that happened at the beginning, that actually turned out to be very significant - I loved the way that everything began to make sense! What a lovely cover. I'm hoping to read this book soon, I''m really looking forward to it!